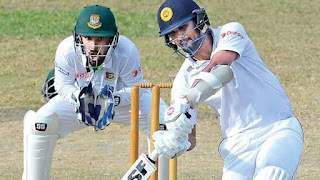 Sri Lanka vice-captain and middle-order batsman Dinesh Chandimal returned to form in timely fashion with a magnificent knock of 190 not out off 253 balls for Sri Lanka President’s XI in the two-day warm-up match against the touring Bangladesh side which ended in a draw at De Soysa Stadium Moratuwa yesterday. Sri Lanka Board XI replying to Bangladesh’s first innings total of 391 for 7 declared finished on 403 for seven wickets with Chandimal’s monumental knock making up for most of the total. Chandimal captaining the side displayed responsibility and maturity as he steered his side towards an honourable draw with an innings that would have given him immense confidence ahead of the first Test against Bangladesh starting at Galle Tuesday next. The exciting right-hander was dropped from the side following a poor run in South Africa where in 12 international innings his highest score was 36 and was told by chief selector Sanath Jayasuriya that he should ‘go back to club cricket’ and work out his game. Chandimal was however named in the squad for the two Tests against Bangladesh and having been given the opportunity to enhance his chances in the Test eleven further and regain his lost form, he was asked to lead the Sri Lanka President’s XI in the warm-up game against Bangladesh. He has responded in magnificent fashion rising up to the challenge stroking 21 fours and seven sixes in an innings that would give immense confidence to the wobbly Sri Lankan middle order for the Test series. Chandimal’s innings came on the back of him having kept wickets the entire first day when Bangladesh batted. He had only a brief rest the following day because the SL Board XI lost their first two wickets by the fifth over. The local team were 29 for three before four half century partnerships involving Chandimal with Roshane Silva (38), Rumesh Buddhika (32), Leo Fransisco (27) and Wanidu Hasaranga (32) and an unbroken century stand of 112 for the eighth wicket with Chamila Karunaratne (50 n.o.) lifted the SL Board XI and helped them gain control of the Bangladesh bowling. The pick of the bowlers for the visitors were Mustafizur Rahman and Taskin Ahmed who took five wickets between them.